Aug. 31, 2014, 10:30 p.m.
Hannah Robinson used to work as a bartender at the original Lucky Country Hotel while studying at uni, so she was curious to see what had become of the much-loved Newcastle spot on Sunday. The Cooks Hill resident was one of 2000 people to walk into the revamped and renamed Lucky Hotel on its first day of operation. “I think it looks great,” was her verdict. The multimillion-dollar development of the Hunter Street venue, undertaken by controversial former lord mayor Jeff McCloy’s family-owned McCloy Group, mixes old with new. Although the interior is fitted out with modern designs, the building’s original brick work and raw iron beams have been preserved. The hotel’s marketing manager Hayley McCloy said they’d had been “overwhelmed” with the turnout. “With the design, basically we’ve tried to salvage as much of the original framework that was here,” she said. Taking the Newcastle Herald on a tour she explained that the establishment, which can hold a maximum of 428 people at one time, was divided into different sections, one of which was called the drum bar. “The reason for this is we’ve constructed a drum set chandelier,” she said, pointing to the ceiling. She said there was also a lounge area that was good for functions and a private gaming room. “The biggest feature would probably be our internal courtyard,” she added. 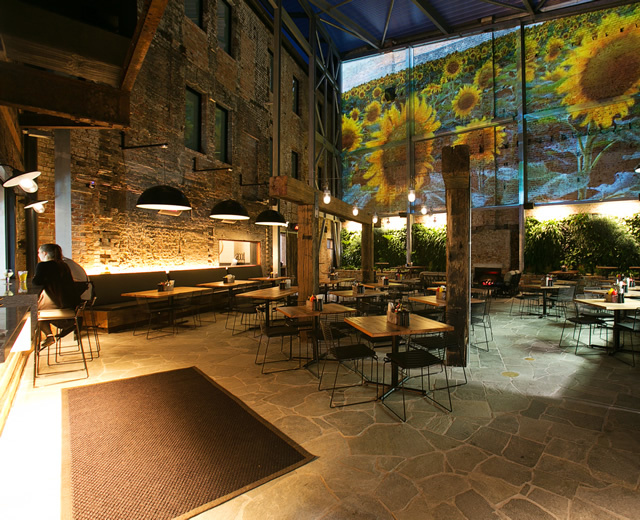 “We have a projection screen which transfers across the brickwork, it’s an amalgamation of images that go for an hour including birds and black-and-white dancing that is absolutely visually stunning. Ms McCloy said their American BBQ themed kitchen, which has a unique, imported Cookshack smoker, had been extremely busy. “We’re really big on beef, pork spare ribs, our pig platter has been really popular,” she said. The Lucky Country also has 29 rooms for accommodation which were decked out by local interior designer Morag Argiris.